L.B. 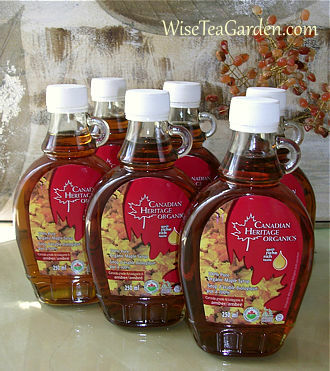 Maple Treat Organic Maple Syrup 250ml glass bottles are in our inventory, will be posted shortly. Canadian Heritage Organics® Pure Organic Maple Syrup is certified organic by Ecocert Canada. Grade A - Amber. Product of Canada. %DV per Serving Size of 60ml (1/ Cup): 15% Manganèse, 4% Zinc, 45% Magnesium, 4% Calcium, 25% Riboflavine, 5% Potassium, 15% Glucides.